Over the last year I’ve been toying with Lightning Page designer & components to identify ways to deliver some creative end user experiences. I previously shared how to create Record Detail Tabs, use Conditional Record Detail Components, and to create a Demo Controller. This latest post comes after a few conversations with Michelle Hansen. She spent many hours converting all of her page layouts to break up her page using Record Detail Tabs. She was doing some testing before deployment and realized a fatal flaw in her (my) approach – by using detail tabs those fields no longer appeared on the create screen or for mobile users. Once this really settled in, I realized how brilliant it was. Page Layouts are the most basic, foundational item of Salesforce user experiences…Michelle’s idea was to abandon the page layout completely for Lightning desktop users. Ok, now that credit has been fully paid, on to the solution. Universal Containers wants to display record details across a series of tabs to provider their sales team with more task-oriented page layout. After testing the new lightning pages their Awesome Admin delivered, users realized they could not see the record detail tab fields on the create screen. Other users noted their mobile record layouts did not include any of the quick action components. 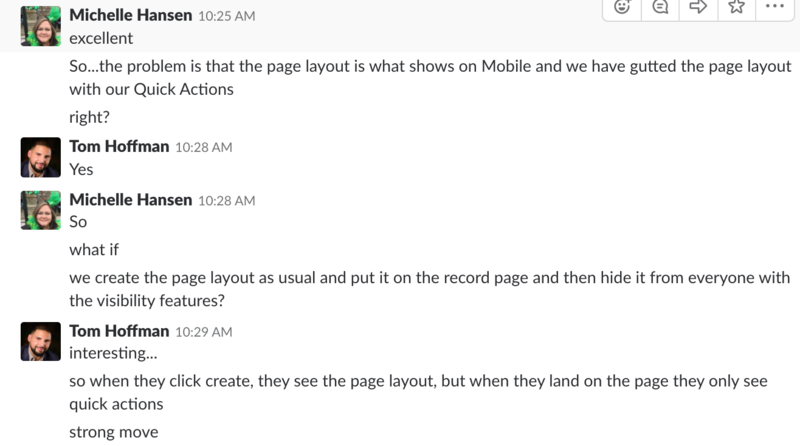 The UC Admin realizes that delivering custom create screens and a mobile layouts would require some serious developer involvement, but luckily the UC team discover they might have an innovative declarative solution; abandon page layouts for desktop users and only use the Page Layouts to control create/mobile layouts. For your object’s page layout, add all the sections and fields you want for the classic users, mobile users, and when creating new records (classic & lightning). The page layout will never be seen by Lightning desktop users other than on record create. If working in an org that has not fully transitioned to Lightning, this approach solves another pain of using record detail tabs – you do not have to make Lex v. Classic profiles to assign different page layouts. Now, create quick actions for the fields you want to appear on your Lightning Desktop interface. You can create one for the main ‘Details’ tab and one for each secondary tab OR you can be creative and create a new quick action for each section so you can provide headers and breaks in the page. Once you are done, create your Lightning Page (as explained in Record Detail Tabs), activate it, and you are done. Lightning Users: See Page Layout fields when creating a record, otherwise see your Quick Actions in tab format on the page.